It’s fall! Time to get honked at for taking cell phone pictures of these gorgeous Virginia colors at stop signs! 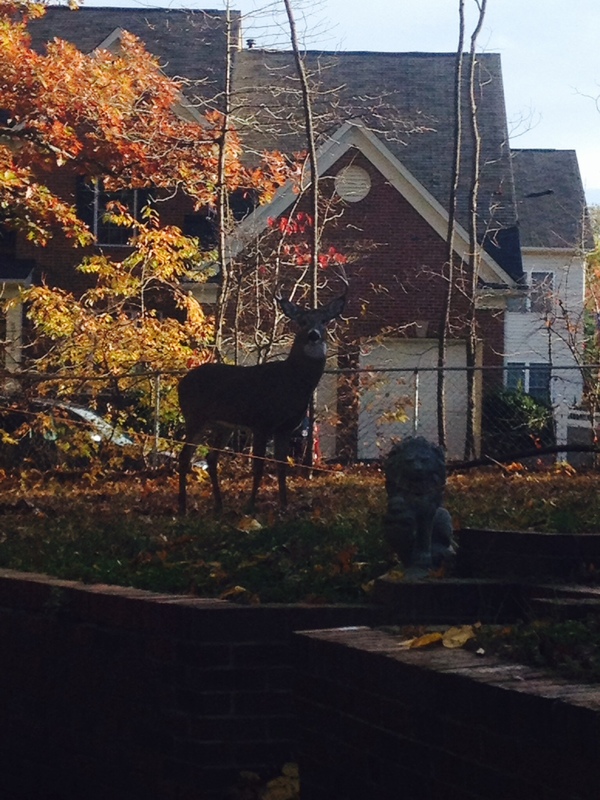 Time to call animal control for the inordinate number of deer that have taken up residence in your yard, one of which appears injured and aggressive (and then time to call your friends with crossbows and eat venison, which is actually legal in Fairfax County). Time to hoard squashes and pretend they’re decorations. And, most importantly, time to roast root vegetables and blend them into soups! This guy has been in our yard all week. Note dog-skewering antlers and note that I have a dog dumb enough to want to play with this guy. Sigh. I am on a total soup binge. It started two weekends ago when I decided that everything I had bought at the farmers market was on its last leg (see new baby) and — in a desperate attempt to salvage it — roasted everything. Butternut squash. Cauliflower. Sunchokes/Jerusalem Artichokes. Potatoes. Carrots. And then, between quarters during the Oklahoma football game (Boomer! ), I threw said roasted things into the blender. I started with a basic butternut squash soup. I’d already made one version earlier in the week and was in the mood to experiment. You barely need a recipe for these blender-based soups, but I’ll give you one anyway. The real fun is in changing the recipe and adding whatever toppings you can muster. I highly recommend crumbling some bacon, thyme or cornbread croutons on top. And, always, parmesan. I include below a Vitamix version (If you haven’t heard, you can make and heat soup in these suckers. Christmas is coming people.) and a stovetop version. Helpful hint: Use a potato peeler to remove the skin of the squash before roasting. Slice the end off of squash for safe cutting, then crosswise in the middle. Scoop out seeds with ice cream scooper. Slice each piece again lengthwise. Place on baking sheet and drizzle with 1 T olive oil; sprinkle with kosher salt, pepper. Roast squash for 50-60 minutes until very soft and lightly browned. Meanwhile, preheat a skillet over medium heat (if making the traditional way, use a pot instead). Add remaining 1 T olive oil; add onion and carrots. Saute until onions are soft and onions and carrots are lightly browned, about five minutes. VITAMIX/BLENDER VERSION: Remove squash from oven and scrape out from the skin with a spoon if you left the skin on. If you peeled it first, just plop the meat in the blender. Place in blender along with carrot/onion mixture and remaining ingredients. Starting at 1 then going quickly to 10, then to high, blend soup for 5-7 minutes until very hot and steaming. Serve immediately. STOVETOP VERSION: Add roasted squash and all ingredients milk to the carrot/onion mixture in pot. Bring to a boil then reduce heat and simmer for 15 minutes. Add milk, then blend with an immersion (hand) blender until very smooth. Heat for five minutes more then serve. The miso ginger-coconut flavor brings something unique out of the butternut squash in this recipe. Leave out or add in anything you like in small batches to experiment. This squash is a wonderfully sweet backdrop for (almost) anything you throw at it. 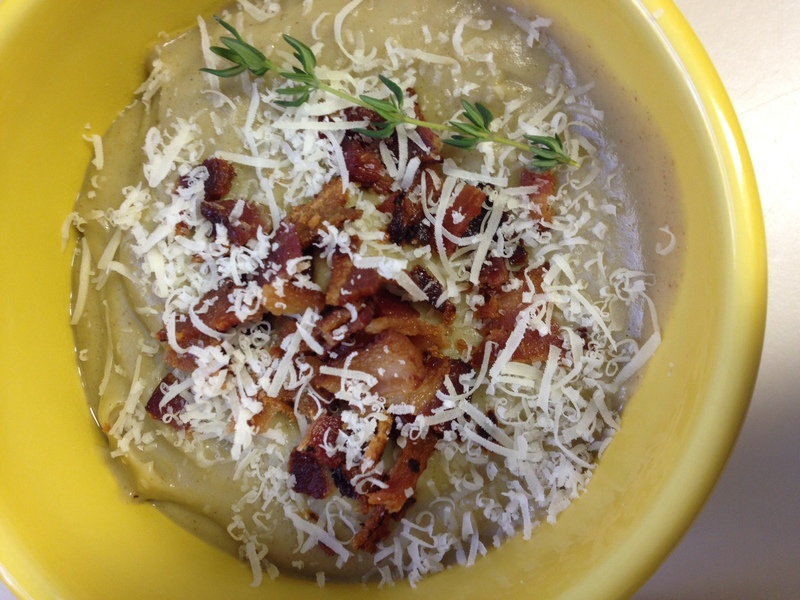 And, if you’re feeling really adventurous, or just swimming in fall vegetables, try blending up this Sunchoke and Cauliflower Soup. And then BLEND THESE TWO SOUPS TOGETHER. Really, I did this, and it was pretty magical. Let’s just say my next job should be as one of those Vitamix display people at Costco so I can just experiment with my blender all day. If you’re looking for more soup-spiration, check out a week’s worth of soup recipes from Relay Foods’ blog here. And enjoy the rest of your fall… and the deer that come with it.